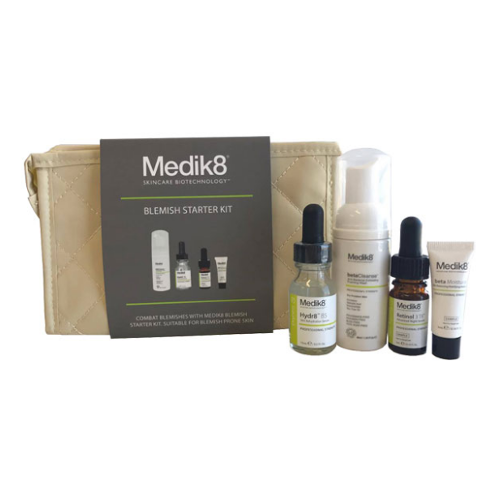 Medik8 just released their range of starter kits and this time I looked to focus on Blemish Starter Kit which features four products made to clear the skin and eliminate further blemishes...more below. The Blemish Starter Kit by Medik8 looks to combat further blemishes and it removes any impurities, oil and dirt from the skin. Looking to achieve clearer and healthier skin starts with a skincare routine that is followed through every morning and night. Occasionally, I would have acne pop up randomly on my skin (and this is due to many factors being diet, hormone, weather, etc..). So by looking to incorporate the Blemish Starter Kit by Medik8 into my skincare routine, I thought I'd give it a go to see what it could do for my skin. In the Blemish Starter Kit, you receive four skincare samples (and a make-up bag which fits everything quite nicely as well as a travel-mirror) and essentially it's a great way to try out the products from the Medik8 range and see what works for your skin. Step 1 - Look to cleanse by using the beta Cleanse Exfoliating Foaming cleanser (40ml). I would use this cleanse morning and night and massage this onto my face using circular motions. The cleanser provides for a deep cleansing suitable for blemished and oily skin. It really is made for those with blemish skin as it contains acid-salicylic acid, tea tree oil and chlorhexidine which assists your skin in preventing further breakouts. I found this cleanser to be quite gentle for my skin and it did not look to strip its natural oils which was great. This product certainly helped to cleanse my skin from any impurities and it's a great start in looking to reduce further blemishes. Step 2 - After cleansing, apply a few drops of the Hydr8 B5 Skin Rehydration Serum (15ml). Essentially you're looking to apply on an oil-free, lightweight and easily absorbed product that contains Vitamin B5 and Hyaluronic acid. As you look to apply on this serum, it works to build antibodies which leaves your skin feeling so hydrated and luminous. This serum definitely looked to leave my skin feeling hydrated all day long and it doesn't look to leave your skin looking oily which is ideal when you have blemish prone skin. Step 3 - After applying on the Hydr8, look to moisturise with the betaMoisturiser a Skin Balancing Mattifying Moisturiser (3 x 5ml). This hydrator is oil-free and does not look to block the pores on your skin. The finishing effect is matte and it's a great way to balance the skin whilst controlling your skin's shine and oil production. This product also looks to eliminate bacteria which can potentially be a cause for further breakouts. As I have been trying out the smaller samples, the product does look to make my skin feel more balanced. As for the random breakouts, I've started to see a reduction which I've so far been impressed with. Step 4 - At night, look to apply the Retinol 3TR (3ml) just before bed. This is a really lightweight and fast absorbing serum containing Vitamin A at 0.3%. It definitely is made for blemish prone skin and it allows your skin to feel more rejuvenated whilst you sleep. It also helps with reducing fine lines and wrinkles which is perfect for those trying to work on anti-ageing of their skin. Overall, it's a nice starter kit to try out if you have oily and blemish prone skin. The samples are also perfect for travelling as they come in smaller sizes. The range has certainly helped to clear up my skin and with regular and continued use, I can expect to see brighter and clearer results. To find your nearest stockist, check it out here. 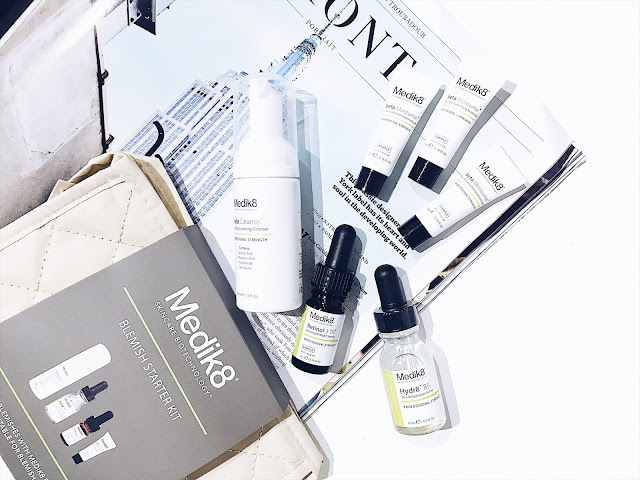 What are your thoughts on the Blemish Starter Kit by Medik8? Thank you to Medik8 for supporting me for this review. My reviews are based on my own experiences and I only recommend products that I truly believe in. Labels: acne, BANISH, BLEMISH, Blogger, love, MEDIK8, new, nourish, PRONE, skin, Skincare, SOLUTION.